Generates a random phrase for you, based off of sentence structures and vocab. With the input of any two terms of a geometric sequence, and a desired term, the user can receive two outputs: the value of the desired term, and the sum of all terms from the first term to that one. For example: if you only knew the first and the third terms of the geometric sequence 1,2,4,8, and you wanted to find the fourth, you would first enter 1 and 3 for first and third terms, and then their respective values, 1 and 4. Then you would enter the term you wanted, 4 for fourth term, and two numbers would be displayed: 8 (the fourth term) and 15 (1+2+4+8). 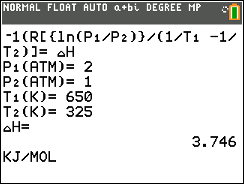 A program to solve for any of three variables: Pressure, Temperature, or Heat of formation.